As springtime storms roll off the Great Plains and into the Nashville area, you can expect strong storms which contain straight line winds, torrential rains, hail, and even tornados. And while you can never know when the brunt of a storm will hit your area, you will never question if it has arrived! Patio umbrellas go flying, unsecured items go flying, and hailstones dance a jig on your roof. While the power of Mother Nature is awe-inspiring to observe, the reality is that it can do substantial damage to your roof. The damage that hail and high winds can do can be more than cosmetic. In fact, the damage a hail storm can do to your roof can significantly affect its ability to do its job. If your home has been hit by a spring time storm with hail and/or high winds, call Tim Leeper Roofing now for a free estimate. We provide a full-range of residential and commercial roofing services, including repairs and replacements. When a hailstorm goes over and pummels your house, the first thing you want to do is to make a record of it. Take a video of the hailstones as the fall if you can. Making a note of the direction in which the fall can help your roofing contractor assess the extent of the damage. Take photos of the hailstones, and be sure to use a common object for a size reference. A quarter is perfect for a relative size reference. Once the storm has passed, and it is safe to venture outside, look around for obvious signs of roof damage. These signs include shingles blown off the roof and into your yard, missing flashing (metal trim found on roofs) and visible black marks on the shingles. Examine objects in your yard for damage. Look for dinged metal, broken glass and wooden fences that have had paint dinged out of them by the hail. Over the next hours or days, look for asphalt granules coming out of the downspout of your gutter system. You may have to wait until the next rainfall to see this, but if you see other damage, go ahead and call us. If you see any of these signs of hail damage, call Tim Leeper Roofers for a thorough inspection. 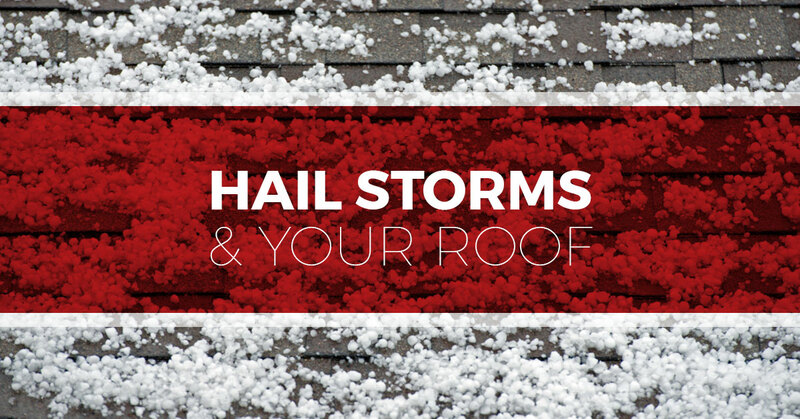 Don’t get up on the roof yourself: this is dangerous, and our professionals know what to look for to assess the extent of the damage that the hail has done to your roof. Our experts know what to look for on different types of roofs. On asphalt shingles, they look for what’s called bruising. Where a hailstone hits, it will loosen the protective granules and create a bald spot on the shingle. Depending on the size of the bruise, a roofing expert can estimate the size of the hail that hit your roof. If you have a metal or shake roof, the damage will be quite visible. Metal roofs dent and shake roof shingle will split. You may think that your roof is resilient and can withstand a hailstorm, and while you may not have hail coming through the under layers, into your home (if this happens, don’t hesitate to call us!, the damage that is done can affect how well your roof does it’s job. The granules on your asphalt shingles play an important role in the health of your shingles. They protect the shingle from UV damage and weather in general. Without them, the shingles can crack and this will let water into the under layers, and into your home. If you have substantial damage from a hailstorm, a full replacement may be needed. Most insurance policies cover hail damage, and you can get a whole new roof for the cost of the deductible. If you don’t claim the damage in a timely fashion, you could run out of time, and you won’t be able to claim future damage, leaving you to pay for the total cost of a new roof out of your own pocket. If you call us after a storm, we can help you will all aspects of the insurance claim. We work will insurance companies just about every day and know how to talk to them. We can work directly with your insurance company saving you countless headaches. If your home has been hit by a hail storm or high winds, call Tim Leeper Roofing today for roof repair and replacement services and the greatest customer service around!